Osteoporosis is the leading cause of fractures in the elderly. It is a disease where low bone mass leads to a decrease in quality of bone, results in increased bone fracture risk.Fractures can cause pain and disability. Primary osteoporosis includes two types:postmenopausal and senile types. 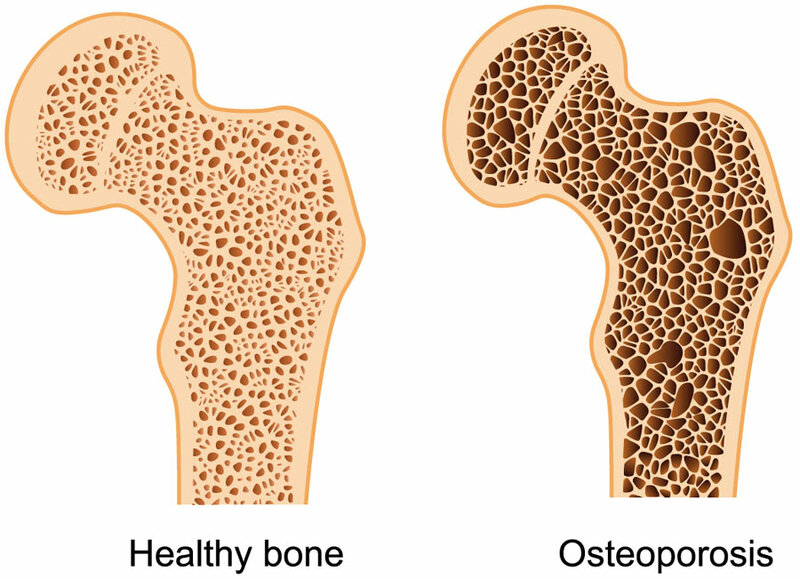 Secondary osteoporosis is when another medical condition (vitamin D deficiency, hyperthyroidism) leads to excess bone loss. No clinical features are noticed until there is a fracture. Patients without symptoms assume they cannot have osteoporosis. Most common type of fractures are vertebral fractures, and go unnoticed until the patient needs a chest or abdominal x-ray. Pain is more likely to be common in osteomalacia in the absence of fractures. Age related changes – cells respond less to factors that help bone growth. This is senile osteoporosis or type II – patients are more likely to suffer wrist, vertebral and hip fractures. Decreased physical activity can increase rate of bone loss. Calcium nutritional state contributes to peak bone mass. Patients with calcium deficiency during rapid bone growth (when younger) are at higher risk. Hormonal influences: Estrogen helps with bone growth and lack of estrogen (post-menopausal) leads to higher risk of having osteoporosis. This is type I osteoporosis – fractures of distal forearm and vertebral bodies are more common. Females (especially postmenopausal women) are more likely to have lower peak bone mass. 85% of women in nursing homes overage of 80 years have osteoporosis. Senile osteoporosis is most common in age >70 years. Asian Americans and Caucasians are more likely to have lower bone density. Patients with low body weight are more likely to develop osteoporosis. The DEXA scan is the gold standard because it is precise in measuring bone density. Patients for whom the DEXA scan is indicated for includes all women > 65 years of age, postmenopausal women <65 with one or more risk factors for fracture, and men with risk factors for fracture. DEXA Scan is done on the femoral neck and lumbar spine and is compared to a standard. If the scan shows bone density < or equal to -2.5 then it is diagnostic for osteoporosis. It is also important to rule out secondary causes so calcium, phosphorus, alkaline phosphatase TSH, vitamin D level, creatinine should be measured. Diet should include adequate calcium (1,200 mg/day) and vitamin D (800U) Stair-climbing and exercise increases bone density. If patients cannot exercise intensely they should exercise regularly to increase strength and reduce risk of falls. Weight training may also be helpful. Patients who are at increased risk of falls should have adequate lighting, handrails, and other measures taken as needed. Physiotherapists can provide excellent advice and education on appropriate exercises. Treatment is necessary for patients with a T-score of 2.5 or less or hip/vertebral fracture. High risk postmenopausal women with osteopenia (T score -1.0 and -2.5) are also recommended to have therapy. First line treatment is bisphosphonates such as alendronate (70-mg once weekly), risedronate (35 mg tablet once weekly) and ibandronate sodium (once monthly dose of 150 mg orally). Side effects: nausea, chest pain, hoarseness, erosive esophagitis, osteonecrosis of jaw (rare). Hormone replacement therapy for postmenopausal patients is a good preventative measure. It does not treat osteoporosis but it can prevent the onset. For men, testosterone administration can help reduce risk of development. Raloxifene can be used by postmenopausal women in place of estrogen for prevention – reduces risk of vertebral fracture by 40%. It does not help the hot flashes, or relieve vaginal dryness, but it also does not carry the risk of endometrial cancer that estrogen replacement therapy carries. Teriparatide – It helps produce more bone, but patients need to have enough vitamin D and calcium. Improves bone density in most bones except the distal radius. It carries the risk of osteosarcoma. It is also expensive and only indicated in patients who severe osteoporosis who cannot have bisphosphonates and those who have fractures despite being on medication. Calcitonin – useful in short term therapy in females with vertebral compression fracture. Physiotherapy – can provide appropriate weight-bearing exercises to help improve bone density issues. Bone mineral density is important to know to help prevention of osteoporosis. Prognosis is good if bone loss is detected early; patients can increase bone mineral density and decrease fracture risk. If a patient suffers a fracture it can lead to chronic pain, and disability.